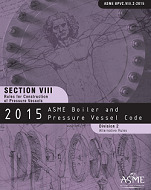 BPVC-VIII-2-2015 provides an alternative to the minimum requirements for pressure vessels under Division 1 rules. In comparison the Division 1, Division 2 requirements on materials, design, and nondestructive examination are more rigorous; however, higher design stress intensify values are permitted. Division 2 rules cover only vessels to be installed in a fixed location for a specific service where operation and maintenance control is retained during the useful life of the vessel by the user who prepares or causes to be prepared the design specifications. These rules may also apply to human occupancy pressure vessels typically in the diving industry.